After we nailed down Caesars Palace as the venue, we worked closely with the couple to chat all-things wedding aesthetic. 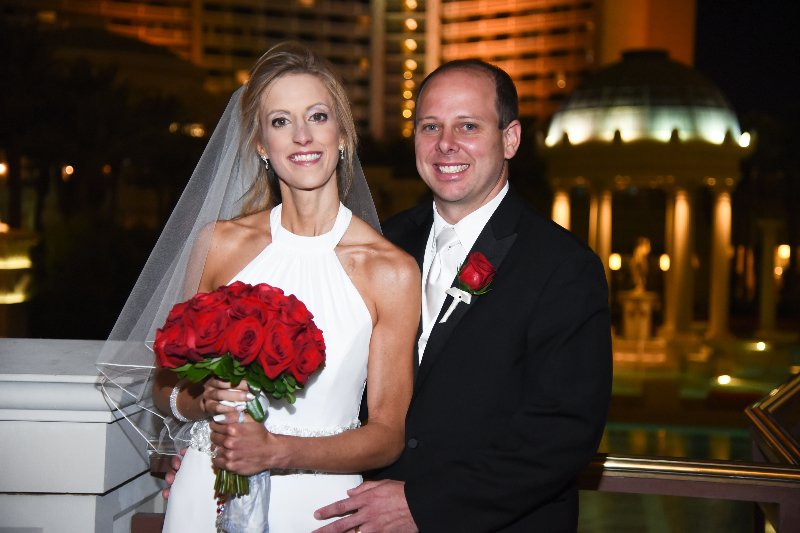 Daniel and Marisa decided they wanted a classic, romantic Vegas feel—gold candles, black-and-white formalwear and columnar centerpieces all made for a timeless, red rose wedding design that felt both chic and celebratory at once. For Marisa’s bridal bouquet, Floral By Dzign crafted a tight, focused arrangement of red roses accented with green Pittosporum. The arrangement was such a stunner, as the dreamy aesthetic of all red roses grouped together made a striking statement and played perfectly against Marisa’s gorgeous stark-white wedding gown. Our floral team also hand-crafted wrist corsages for Daniel’s and Marisa’s mothers, which included red spray roses accented with green Pittosporum. Following the ceremony, the couple entered the reception venue to the sounds of Elvis, which ended up being a huge hit. 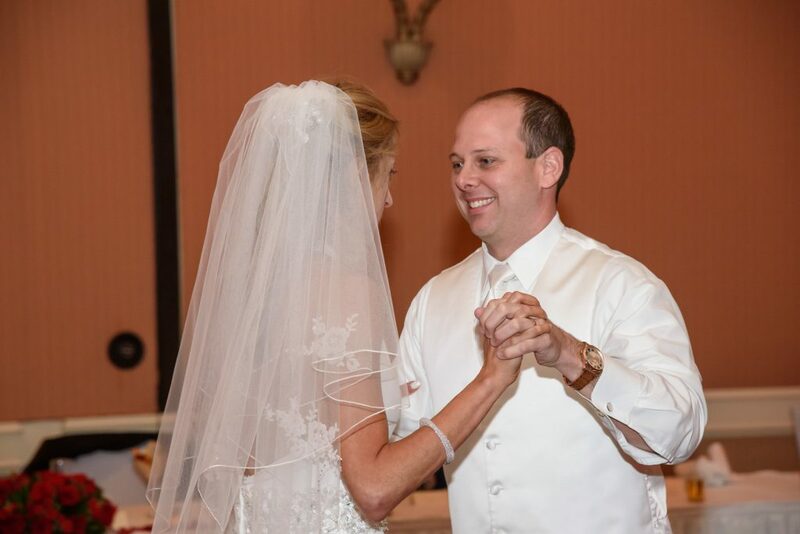 “Our favorite part of the wedding day was making our grand entrance into the reception to Elvis Presley’s ‘Viva Las Vegas’ and finally getting to see the beautiful decor set up by By Dzign and the smiling faces of all of our friends and family,” Daniel said. 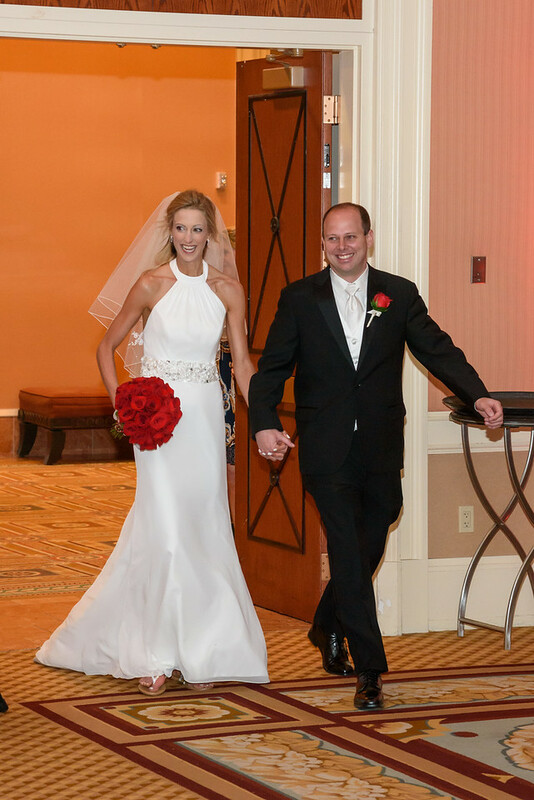 For the reception, we worked with stunning floral arrangements and strategic red lighting to create a warm, romantic atmosphere for the couple’s classic red rose wedding. 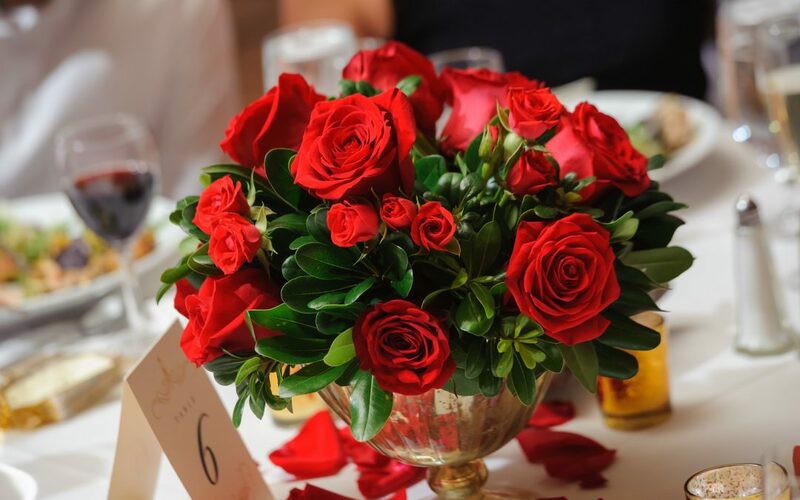 For guest tables at the reception, Floral By Dzign crafted timeless centerpieces of red roses and red spray roses, accented with green Pittosporum—all arranged inside gold mercury compote vases. Red rose petals and gold mercury votives also surrounded the bottom of the vase, creating the perfect balance of classic hues and modern metallics. 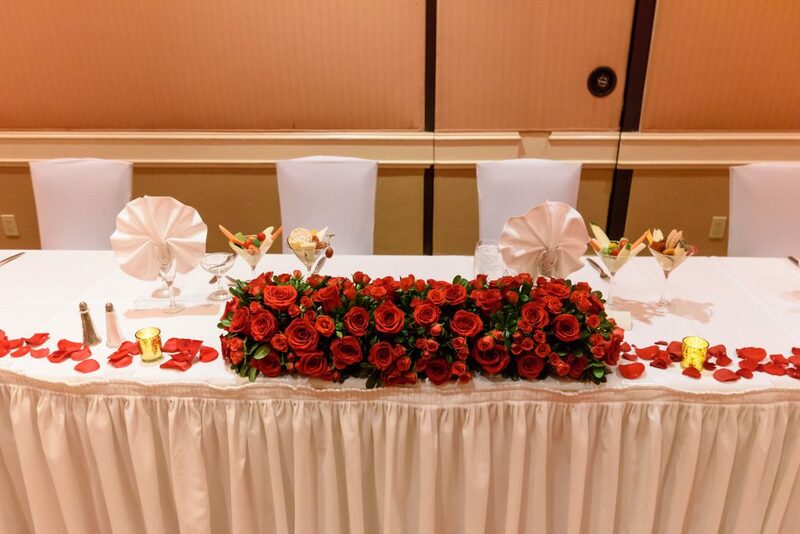 Marisa and Daniel’s head table included a long and low arrangement of red roses and red spray roses, all accented with green Pittosporum. Red rose petals and gold mercury votives accented either side of the massive arrangement and worked to soften the space and add some color to the understated, creamy-white linens. 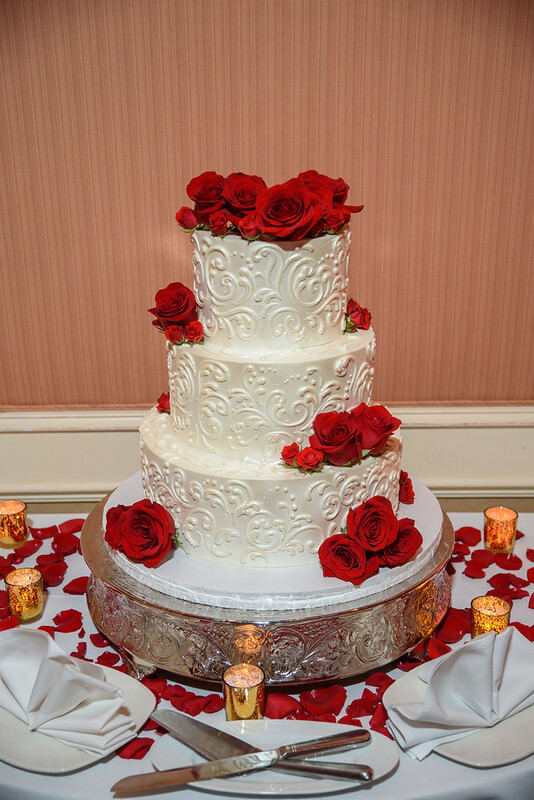 Floral By Dzign also added classic red roses and smaller red spray roses to to accent the stunning cake made by the talented catering team at Caesars Palace. 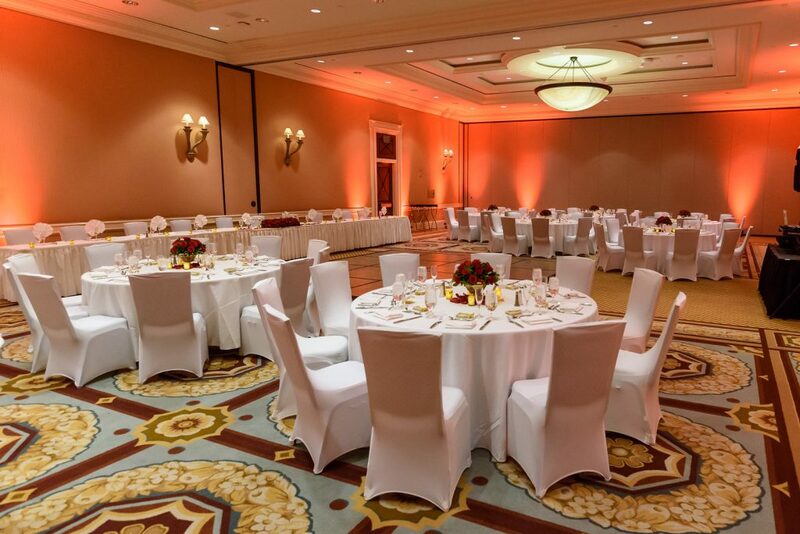 Overall, the space felt both timeless and romantic at once—with just the slightest touch of Vegas sparkle. Immediately after their celebration in Vegas, the couple darted off to the island of Kauai where they spent their honeymoon hiking and “adopting” a dog for a day through a program organized by the Kauai animal shelter. They now spend their time traveling together, rooting for Ohio State football and the Cleveland Cavaliers, and fossil/gemstone hunting!